*I'm 19, asexual, ENFP, Sagittarius, and I go by she/her pronouns please! 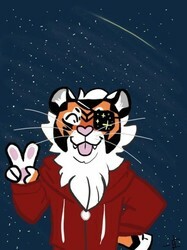 *My fursona is a tiger named Rosencrantz! *I really like comic books, anime, cats and Shakespearean literature!